It's the end of January and we can't wait to see what you think about this update. From new particle spawning methods to a revamped selection node system, we think you'll be impressed. We fixed an error where educational licenses wouldn't validate properly. After changing the way our select node worked, some presets broke. These are now fixed. Node connections may have slight glitches if they point backward too sharply, though we have made an attempt to fix this again. The software may take 2-20 seconds to validate your license key. This is a serverside error on our part and we're working to fix it. Sometimes you may feel like the software is hanging up on start for quite some time, but it's actually waiting to hear back from our server. You should now get a steady 60 fps in most circumstances. We added multi-threading for node computation which should significantly speed up the rate at which your vector fields update and simulate. Your vector field will only update if a change is made rather than computing the node graph over and over 60 times a second. No more wasted electricity. 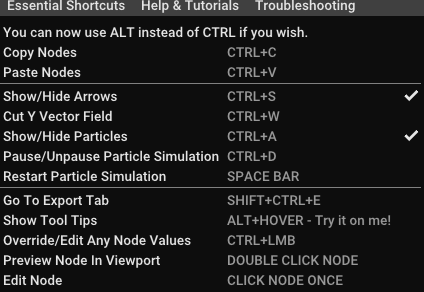 For those of you who don't like using the CTRL key + a letter, you now have the option to use Left ALT + whatever the hotkey is. Both are interchangeable. Space Bar now resets particles instead of CTRL + R.
The Select node can now blend the vectors based on distances from certain shapes. For now, it supports cubes, spheres, cylinders and planes, all scaled, oriented and positioned freely. By default, the select node will show a selection shape and color the arrows. Red is what the select is selecting, and blue represents the outside of the selection. If you are blending your selection red will blend into blue to form purple. The Export panel no longer has the options to scale the vectors intensity by the reference unit. Instead, you can either add a Scale node at the end or scale after importing it into your engine. An estimate of the exported file size has been added to the Settings tab under Vector Settings. Removed clutter that did not have anything to do with the selected node. 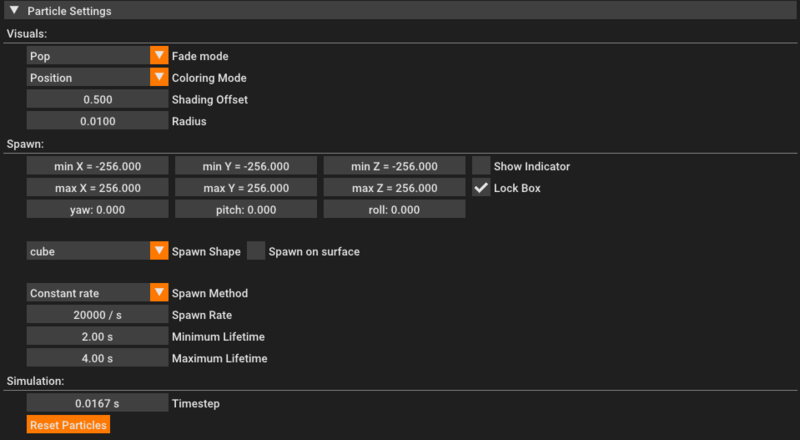 Slider/drag widgets that are related will now have the options to be locked, which means that you can change all values at once using a single slider. The text now scales (up to some limit) in the Node Graph panel. Connections are now easier to use. You can drag a connection into an occupied slot or drag a connection backward into a forward facing pin. Renamed from "3D View" to just "View"
A gizmo is added to the lower left corner. Red is X-Axis, Green is Y-Axis, Blue is Z-Axis. Relevant simulation information is now displayed in the upper left corner. There is now one Settings panel with different sub-menus to prevent our UI from looking like a raging dumpster fire. Duplicate settings from other tabs have been moved to the relevant settings sub-tab where appropriate. You can now set a constant vector density that will scale the number of vectors based on the dimensions of the box. The colors used by the select node to visualize the blending distance can be adjusted. Widgets are moved from the Node Graph to this submenu. You can lock the bounding box widgets so that changing one slider changes all of them proportionally. Each particle can be colored by three modes: By a constant color (adjustable), by lifetime (adjustable), or by position (old version). A time step widget was added so you can slow down or speed up the particle simulation. A new integrator (RK4) makes the simulation accurate even for very large time steps. The spawn rate can be adjusted, by specifying how many new particles should be spawned per simulated time unit. A "burst" mode is still in, where you can instantaneously spawn a set amount of new particles (adjustable). The minimum and maximum lifetime of newly spawned particles is now adjustable. The size behavior of the particles can be adjusted. They can either pop in and out of existence, fade in and out, or be sized proportionally to the remaining lifetime. The spawn location is fully adjustable by specifying a minimum and maximum coordinate bounding box for that spawn location. Multiple spawn modes are in. For now, using a cube, a sphere, or a cylinder, where the position, size, and orientation can be changed by the options mentioned above. All spawn modes can optionally spawn particles only on the surface of the spawn location. A visual indicator for the particle spawn location is in. A toggle will enable a semi-transparent shell to show where particles will spawn. A slider for UI scale. (Warning: things might look blurry when upscaled). Variables for cutting the viewport (only showing some of it at once). Added a "New Vector Field" option under the top left file menu. Added VectorayGen Icons to task tray and top left.